My name is Bianca Dörr and I work as Lead Artist at Mimimi Productions. I am responsible for planning the art team and making sure the art style remains consistent and has the desired quality. For Shadow Tactics, I made most of the textures, worked on the lighting setups and tone mapping/color grading. We tried many different types of styles. 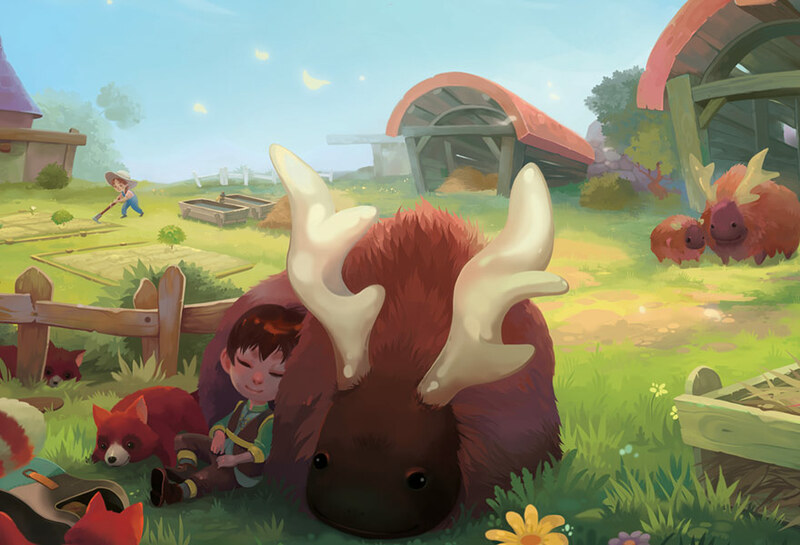 In the beginning, we thought about a very cartoony and cute look but we quickly decided that a more realistic look would suit the game better regarding the mature story. We also didn’t want to lose the old fans of Commandos and Desperados which had a realistic style. But we didn’t want to go too realistic because on one hand we wanted to maintain the possibility of being creative and on the other hand we don’t have enough artists to make a hyper-realistic style. So, to create a unique and outstanding art style we mixed realistic with non-realistic elements like outlines and vibrant colors. First of all, from an artistic point of view, we needed to understand the Asian culture and their way of designing things like buildings and clothing and even how people lived and behaved. So, we did a lot of researching by studying photos of Japan, old ink paintings, and books about Asian architecture, and their way of living. We even had a book about rice farming that we read. We had concepts, mood arts, a color palette, and a style guide which documented our vision so everyone would know how the style should feel and look. But through the whole development, you need to compare every asset and every level with one another so they all match the style. From time to time, we showed the game to other people outside our team to ask if they feel like something is off or weird looking. That’s also very important because after a while you don’t see the mistakes anymore. From a technical point of view, we needed new shaders, a better lighting system, and had to learn new tools and programs. We did a lot of research because we wanted to achieve the player feeling like he is in real Japan and not in some kind of fantasy parallel world. We tried to build assets that really existed in that era. We used books and photos to study the Asian way of design. We even asked a Japanologist from a local university to advise us so that we got the look and feel right. He visited us a couple of times and explained what needed to be changed and what was already done right and provided us with more books and some of his study materials. He helped us a lot. We went for a realistic, period appropriate style with a little touch of fantasy. Some of the assets had to be designed to support some gameplay elements. 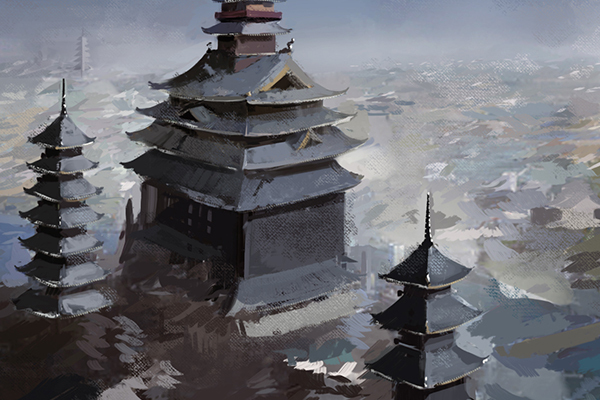 Meaning that some realistic aspects had to go, but we tried to design them in a way they would have done it in the Edo period so these special assets didn’t feel off. For example, Asian village houses have very steep roofs so you can’t climb or walk on them. But we had our vertical gameplay where you climb on roofs to avoid the enemies’ views or kill them from above and didn’t want to lose this for village levels. So, we added some kind of roof terrace around the roof that are walkable but in reality, these houses had no terraces. One thing that we tried to embellish were the character’s headdresses which are exaggerated to show the social rank and importance of a character. 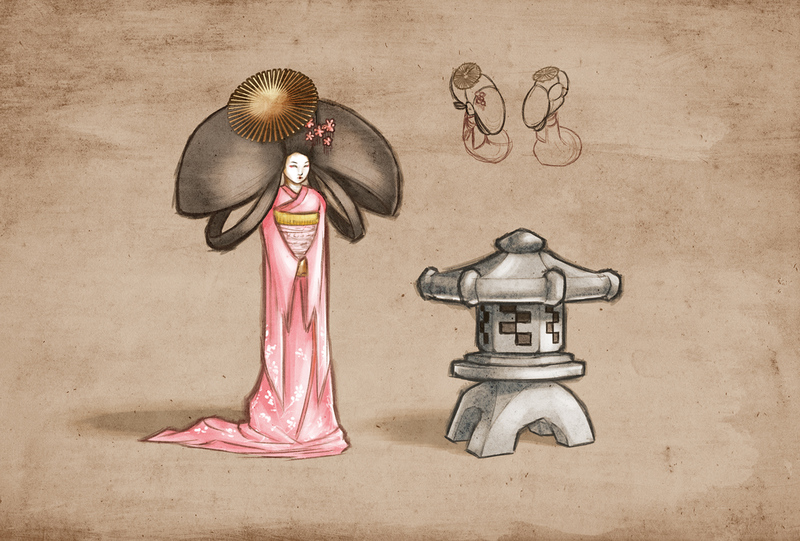 For example, Aiko has very big hair in her geisha costume and all the other NPC geishas have normal sized hair. In the fourth level, we added a bit more fantasy. 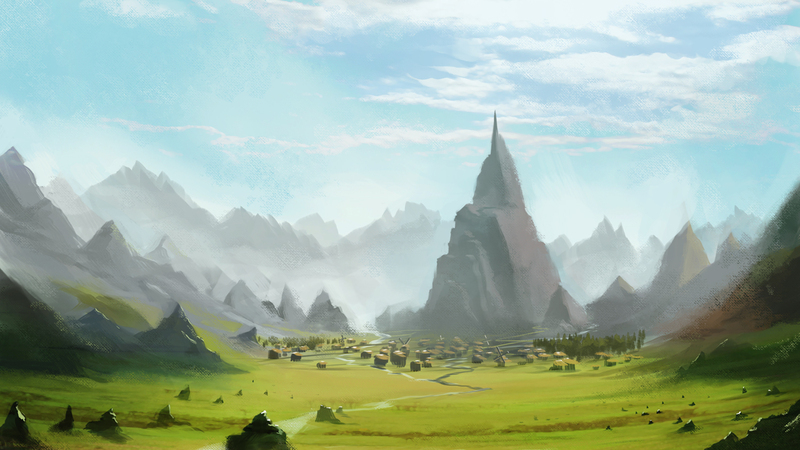 This level is set on a mountain with a monastery and buildings in which monks live. They have golden roofs, statues made of jade, and highly detailed walls. In reality, you will find highly detailed monasteries on mountains but not with golden roofs. But we wanted to make this level very special and since it’s already a fantasy like setting with buildings on mountains, we thought we’d exaggerate that a bit more. 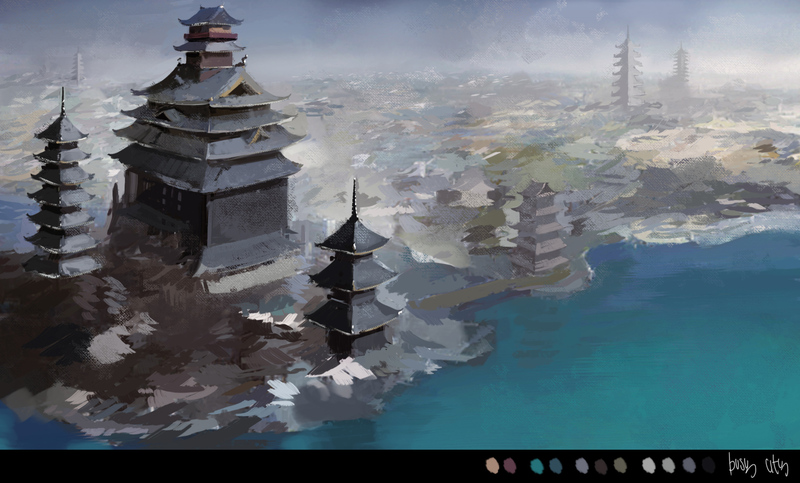 For the color palette, our concept artist made some mood arts that helped us to define the colors we wanted to use. It was important to choose the right colors so that we had enough contrast between characters and environment or otherwise the player wouldn’t see the characters. That’s why we made them all a bit brighter and more saturated. In general, it’s always important to use enough different color variations and eye-catching colors for important assets so you instantly know what you can use and what not or for finding the right way. Furthermore, we added some colorful spots and landmarks in each level that attract attention and would give a level variety. For example, in the third level, we added a colorful market with pennants and flags in different colors and shapes that were a great contrast to the white snow. In other levels, we used colorful trees and flowers to define special areas. It is also a great way to let the player know where he is so they won’t get lost. It’s like a point for orientation. Enemy colors were also important. We had to pick the right colors for the enemy armies so they wouldn’t blend into the environment. We have four different factions and each one of them has its own color. The difficulty was to give them colors which the environment didn’t have. So if a level had many red assets with an orange/red lighting setup we couldn’t place red colored enemies there or the player wouldn’t recognize them. That was a loooooooong way. First, we had many iterations for the concepts until we finally were happy enough to make some 3D models. Then we implemented the models with a dummy texture into the engine to see whether they have enough or too much detail, again many iterations had to be done. Then they got their final texture and again it had to be reworked over and over. It was quite difficult to achieve a look where they had enough detail to look interesting and cool but wouldn’t blend too much into the environment. Also, because of the perspective and size of the characters, you couldn’t recognize some of their features and body parts. 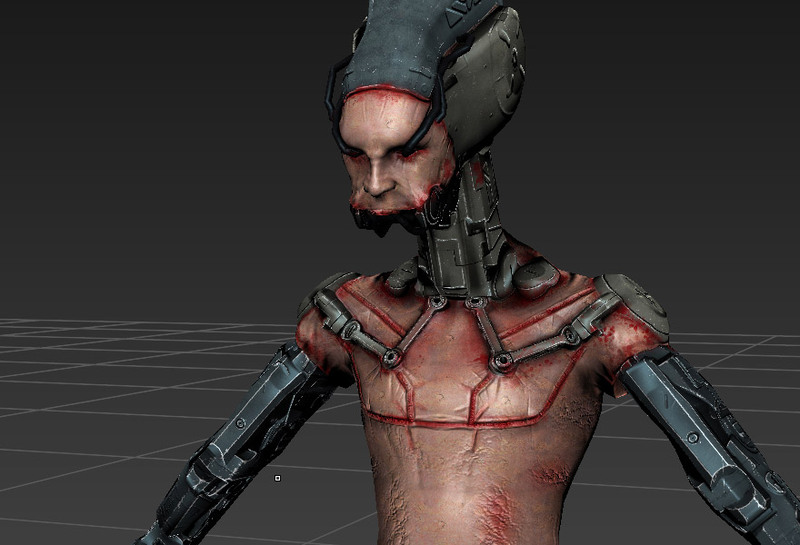 For example, a helmet would look like a head so these parts had to be reworked. Even when we thought the characters were done at that point, after testing them for a while in-game we would find some flaws and rework them. Till the end of production, we kept reworking stuff on the characters. For the generic enemy, we used a classical foot soldier with light armor. Depending on what type they should present, they either wear a hat or not. Cause some enemies don’t leave their position and can’t be lured by Yuki’s whistle. We had to give them something that would differentiate them from one another so we gave them hats. The strong samurai which can’t be normally killed wear heavy armor and big helmets. Another way of distinguishing enemy types was different weapons and attachments such as the flags which the officers wear on their backs. We were struggling the most with Mugen and Takuma since they are not ‘ninjas’. The idea for Mugen was to have a huge samurai who isn’t very stealthy at all, which is awesome and risky in equal amounts because big bulky tanks normally don’t fit into stealth gameplay. It was a gamble but luckily Mugen’s gameplay worked out as intended and we were able to keep his design as a big strong samurai, instead of just a slightly stronger and more armored version of Hayato. Of all the characters, Takuma is the most different because he doesn’t even have a regular melee kill etc. We always wanted one of the characters to be VERY different from the others and WAY less acrobatic, we even thought of putting Takuma in a wheelchair so that Mugen would have to pick him up to carry him up and downstairs, or to throw him over walls etc. We also wanted Takuma’s disability to be some sort of war-injury, like a nasty burn from an explosion, or blindness. We decided to give him a peg leg because the idea of him transforming his wooden cane leg into a rifle was just too good. The first character we ever put on paper was Aiko’s geisha version. The hair was so long that she had to curl it around her head in a ridiculous way, but her over-the-top design lead us to the mixed realistic/non-realistic type of design we ended up with. Did you keep the Perspective in Mind? Yes, we had to include the perspective as the way we designed things. Since you see most of the assets from above you must make the top side of the assets more interesting than the rest. Japanese buildings are often richly decorated under the roof with some kind of pillars. Due to our perspective, you don’t see much of it because the roof covers this up. So, we could just leave these details which saved many polys. Also, the characters are a bit influenced. They have longer legs than normal humans have because the perspective causes some kind of distortion which makes normal long legs look wrong and anatomically incorrect. 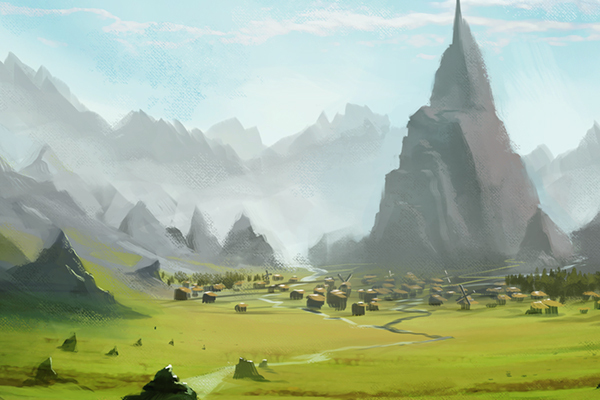 While developing the game, we used a few new tools and software and had to learn many new techniques to create the unique style and quality we aimed for. Regarding textures, I had to learn Quixel’s NDO which is a plugin for Photoshop for creating normal maps. That was very useful because we only made low poly models so we couldn’t bake any normal maps from high detailed models. But with NDO you can create normal maps from scratch by painting them with the Photoshop tools or convert greyscale textures in normal maps. Which was quite handy! Another big innovation we used for Shadow Tactics was color grading. It’s a very powerful technique for manipulating colors to change the look and mood of your level. We wanted every level to have a certain atmosphere and mood with interesting lighting setups. Using color grading really helped us a lot to achieve this. Our coders provided us with many little tools like the ability to paint fog in a level so you can determine very precisely where you want more fog or none. With the same technique, we painted blur which we used for level bounds. There were many more little things that were new for us like creating snow, detailed terrain painting, etc. It really was a time full of learning and developing our skills as artists. And it was worth it! It always felt good to accomplish something new that helped to create the graphics we wanted and which we are very proud of! We wanted to make a game with high detailed levels and a unique art style that instantly feels like you’re in old Edo Japan. We have great respect for the Asian culture and wanted to make everything as believable and historically correct as possible. But we also wanted to add something special to make it outstanding and not too standard. The characters and their personal stories were also something that was very important to us. We created the characters as life-like as possible with unique personalities so that the player loves and feels with them. And as artists, we wanted to reach a new level of skills to create a game we can be proud of and that can compete with big titles. One of the biggest challenges was to create a style that had a high level of detail, looked unique, could compete with other modern games, and was doable in the short time we had with limited artists. For that, we had to learn many new things, like new tools and skill sets to reach the quality we wanted, which was a challenge because we needed to take the time to learn those. Another problem was that we had very different visions of the style and we had to find something that every team member could relate to. In the beginning, we had many and long discussions which did not always go happily for everybody because we all were so passionate and wanted to give some input. But with time and many, many iterations and analyzing different styles from other games we created a style everybody was pleased with. It’s also important that you keep in mind that you can’t make everybody happy. Many times you have to compromise or else you get stuck and that is something we also had to learn during development. I think I’ve become better in texturing and making UV layouts. I also learned new ways of making the game look better like color grading and lighting, and new tools like Quixel. In general, I expanded my skill set. I am looking forward to seeing many people play Shadow Tactics and have fun with it. So far, people really enjoy it and we have received very positive feedback and supportive emails. After nearly two years of hard work, that’s the best reward you can get: people loving your game. Of course, that’s something I hope our future games will also achieve and that Mimimi Productions will exist for many years and create much more games for you to enjoy. I am glad to see more and more people enjoying and playing video games because something I wish for our industry is that the world would acknowledge us more. When I tell someone that I work in a game company they always assume we just play all day and have an easy life without stress. Even in media, they don’t take the game industry seriously. Most people fail to see how much effort, time, and work goes into creating a game. But more and more people who really are into gaming seem to grasp what it means to develop a game and show interest in the creative process. They share their enthusiasm with others. Even non-gamers slowly begin to understand these processes and take it more serious. That’s a development I am quite happy to see.